A picture shows on May 11, 2018, the compound of the U.S. consulate in Jerusalem, which will host the new U.S. embassy, as posters praising the U.S. president hang in the street. The Jerusalem no man’s land where the U.S. says part of its new embassy to Israel will be located is a territorial quirk of the Arab-Israeli conflict, a quirk that originated at the start of hostilities in 1948. 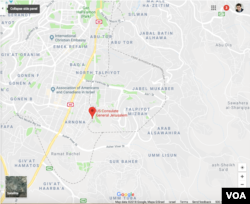 Google Map of southern Jerusalem, showing the five-sided box created by the Israeli-Jordanian armistice lines of April 23, 1949. The new U.S. embassy will be located at the U.S. Consulate General complex in Jerusalem's Arnona neighborhood. The western armistice line of the five-sided box passes through the complex. The U.S. will inaugurate the embassy Monday in an existing consular complex at the southwestern corner of a no man’s land that appears as a five-sided box on contemporary U.S. government and Google maps of Jerusalem. That zone first appeared on a map in a much smaller form in May 1948. At its heart is a compound known as Government House, built in 1933 on a strategic hilltop to serve as the headquarters of the British High Commissioner who ruled the then-British Mandate of Palestine. When Britain ended its rule of Palestine on May 14, 1948, it withdrew from Government House and handed the keys to the Red Cross, which a day earlier had declared a Red Cross Zone around the site. The rectangular-shaped area was meant to be a safe haven for refugees from the war that erupted May 14, as Israel declared independence and Arab nations declared a war to destroy the Jewish state. Red Cross Zone declared by the International Red Cross on May 13, 1948 around Government House in Jerusalem. Source: Annex 1 to Case No. 6 of U.N. Central Truce Supervision Board Findings, Israel State Archives. 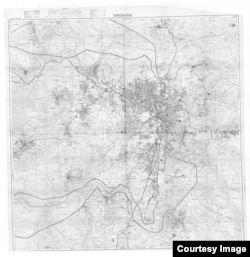 ​Fighting in the area persisted, prompting a U.N. Central Truce Supervision Board to create a Neutral Zone around the Red Cross Zone, Aug. 27, 1948, to try to push the combatants farther away. 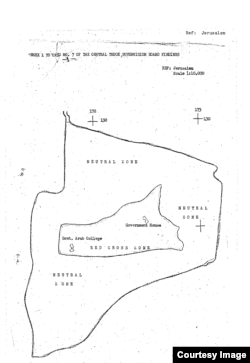 Neutral Zone declared by the International Red Cross around the Red Cross Zone, Aug. 27, 1948. Source: Annex 1 to Case No. 7 of U.N. Central Truce Supervision Board Findings, Israel State Archives. The Red Cross pulled out of Government House, Sept. 30, 1948, and handed it to the United Nations, which converted the building into a base of the U.N. Truce Supervision Organization (UNTSO). U.N. personnel demanded that Israeli and Arab forces continue to stay out of the former Red Cross/Neutral Zone around Government House, essentially turning the area into a U.N.-mandated demilitarized zone. Israel and Jordan, one of the warring Arab nations, signed an armistice agreement on the Greek island of Rhodes, April 3, 1949, and attached to the document several maps with hand-drawn armistice demarcation lines between their forces. In Jerusalem, where the fighting left Israel in control of the city’s western part and put Jordan in control of the east, the two sides were unable to agree on a single line dividing the city between them. So they drew two sets of lines representing where they thought their boundaries should be, with the Israelis drawing a line farther east and the Jordanians drawing a line farther west. The agreement referred to the gap in the armistice lines as an “area between the lines” in which neither side was permitted to send its civilians or security forces. Israeli-Jordanian Armistice Demarcation Lines of April 3, 1949. Source: U.N. Treaty Series No. 656 - Israel and Jordan General Armistice Agreement, Annex 1 Map 2. Through most of Jerusalem, the dual armistice lines ran close together, creating gaps from a few meters to a few hundred meters wide. But in the area around Government House, the lines widened considerably as Israel and Jordan agreed to put UNTSO’s broad demilitarized zone between them. UNTSO wielded authority in the Israeli-Jordanian conflict, not just as the mediator of a Mixed Armistice Commission that included delegates of both sides, but also as the arbiter of their armistice disputes. 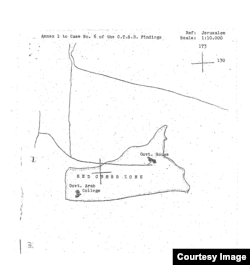 In a quirk of the April 3, 1949, map, the southern perimeter of the U.N. demilitarized zone around Government House disappeared. As the dual armistice lines moved south of that zone, they narrowed slightly but remained some distance apart as they looped toward the west. Within weeks, the lines changed again. In a new, unpublished map signed by Israel and Jordan, April 23, 1949, and seen by VOA, the two sides reinstated the southern perimeter of the zone around UNTSO. They also removed the wide gaps between the lines running through southern and northern Jerusalem in the April 3 map, merging the dual armistice lines into single lines. A stretch of the Jerusalem-to-Tel Aviv railway that had been in southern Jerusalem’s no man’s land was now in sovereign Israeli territory, while the no man’s land around the Arab village of Beit Iksa, north of Jerusalem, became part of Jordan. 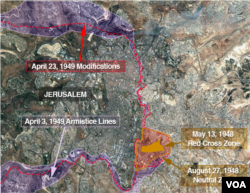 The Israeli-Jordanian armistice lines of April 23, 1949, later were replicated in U.S. government maps of Jerusalem that have been published and mirrored in Google’s online map of the region. The 1961 U.S. Army Map Service Map of Jerusalem. Source: University of Texas Perry-Castaneda Library Map Collection. Besides Government House, the zone also contained a Jewish agricultural school and farmland as well as parts of Jabel Mukaber, an Arab village. Israeli, a former Mixed Armistice Commission delegate, said Israel and Jordan decided, without consulting UNTSO, to divide the zone between them except for the Government House compound, creating three sectors: an Israeli sector in the west, a Jordanian sector in the east, and a small UNTSO sector in the middle. In the following years, Israel and Jordan allowed their civilians and even security personnel to operate within their respective sectors. But each side occasionally complained to UNTSO about the activities of the other side, and they never formalized the partition on a legally binding map. 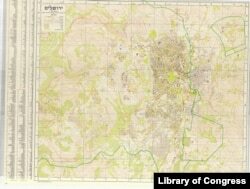 1958 Israeli Surveying Department Map of Jerusalem. Despite the lack of an official agreement, Israel drew the partition onto its own maps of the zone around UNTSO. One such map, published by Israel’s surveying department in 1958, shows a thin green line bisecting the zone into western and eastern sectors and surrounding UNTSO’s compound in the center. The Israeli foreign ministry’s online map of the 1949 armistice lines also shows the partition. It is not clear if Jordan ever marked the partition on its maps. The Jordanian government did not respond to a VOA request for official maps from the period and declined to comment on the issue. In the 1967 Arab-Israeli war, Israel captured the entire zone around UNTSO, as well as eastern districts of Jerusalem that had been under Jordan’s sovereignty. Jordanian forces had seized UNTSO’s compound at the start of the six-day conflict, but Israel pushed them out and later allowed UNTSO to resume its use of the compound. The war also enabled Israel to draw a new municipal boundary for Jerusalem, annexing former Jordanian territory and the areas between the armistice lines and proclaiming them to be part of a new, united capital of the nation — a move never recognized by the U.N.
Map of Jerusalem showing the changing lines that created the territorial anomaly where the new U.S. embassy to Israel will be partly located. Jordan’s King Hussein renounced his territorial claims to the Israeli-occupied West Bank and East Jerusalem in a July 31, 1988, national address, saying those territories should become part of an independent Palestinian state. In a comment to The New York Times in March, Palestine Liberation Organization negotiator Ashraf Khatib said the zone around UNTSO should be part of negotiations to resolve the Israeli-Palestinian conflict, in which that zone is one of the biggest territorial anomalies.